Day three of the show and visitor numbers maintained momentum from previous years with retailers and buyers flowing through the halls of the Harrogate Convention Centre. Hall Q, which houses the majority of new exhibitors at the show and also the main catering area, has been particularly busy and has some extremely interesting new product ranges. 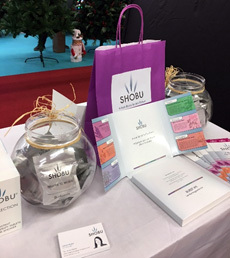 Shobu is a new business exhibiting at the show for the first time with a gorgeous range of ‘bath’ bombs for the shower. There are six fragrance combinations to chose from, Sleep with lavender, Bergamot and Vertiver; Breathe with Eucalyptus, Rosemary and Peppermint; Awaken with Grapefruit, Geranium and Mandarin; Seduction with Rose, Jasmine and Musk; Refresh with Ginger and Nutmeg; and Indulgence with Camomile, Clove and Cardamom. 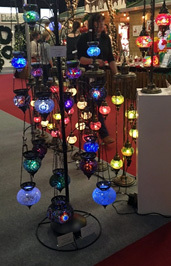 Crystal World is an importer and distributor of beautiful hand-made glass, crystal and giftware and has a range of colourful glass lamps at the show. 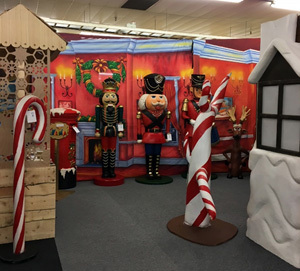 Garden Centres and retailers wanting to host Santa grottos should check out Prop Me Up Events which has a fantastic range of settings to hire or can custom build to order. 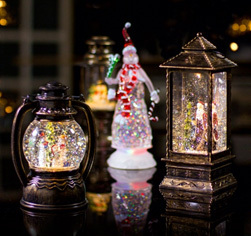 LED lamps make great gift ranges as well as dazzling additions to any Christmas display and Premier Decoration’s best-selling glitter lamps combine a number of exciting retail opportunities. Based on a similar principle to a snow globe, these eye-catching creations are filled with water and have battery operated movement inside which blows the water and glitter bringing a depth of colour-changing reality to the scene inside. These offer retailers great value with Premier’s special pallet deals. 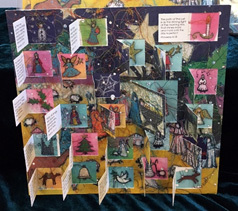 Many families enjoy age-old family traditions and Swiss Kiss’s beautifully illustrated advent calendars fit the purpose perfectly. All have pictures or jokes behind the windows with either answers, biblical quotations or facts appropriate to the subject on the back of the window. These also come in greeting card sizes and make lovely gifts for all ages.